Important! Seat charts are not available for repeating events and variable products. The Seats addon is required. 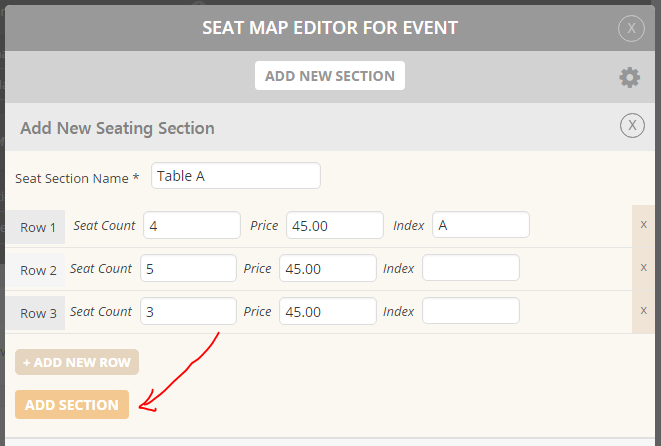 Go into wp-admin > Events and edit the event that you wish to add a seating chart to. 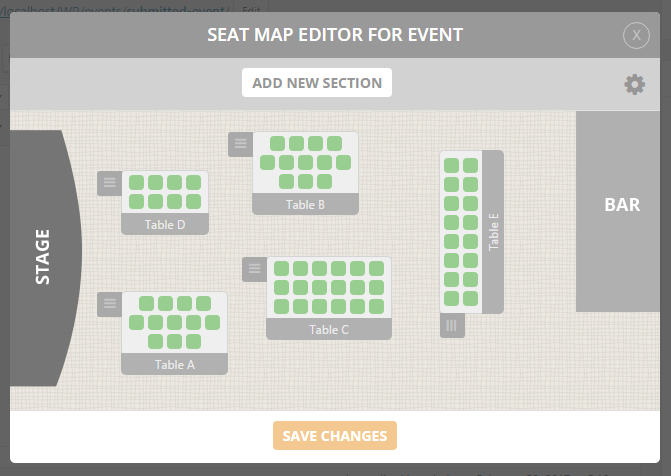 Before you can start adding a seat chart you MUST activate the Event Tickets for your event. To activate Event Tickets, scroll about 1/2 way down the page to the “Event Tickets” section and click “Yes” to activate. Once active, fill in your ticket information such as ticket price and SKU. Lastly, save your work by clicking “Update” at the top right hand side of the page. 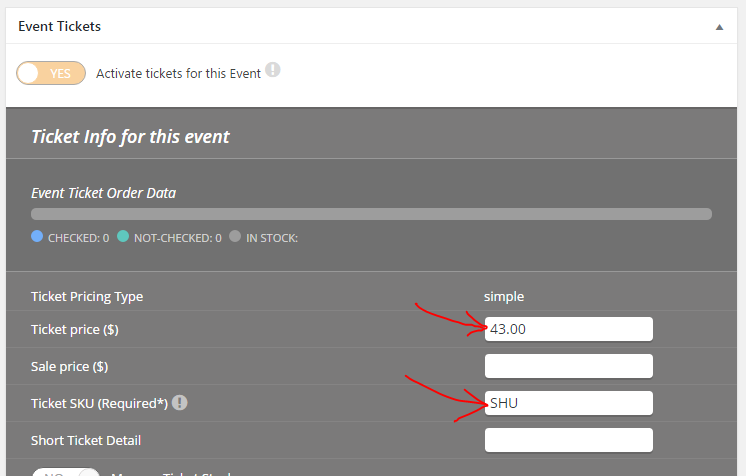 Once you have saved your ticket information, scroll back down to the “Event Ticket” box. 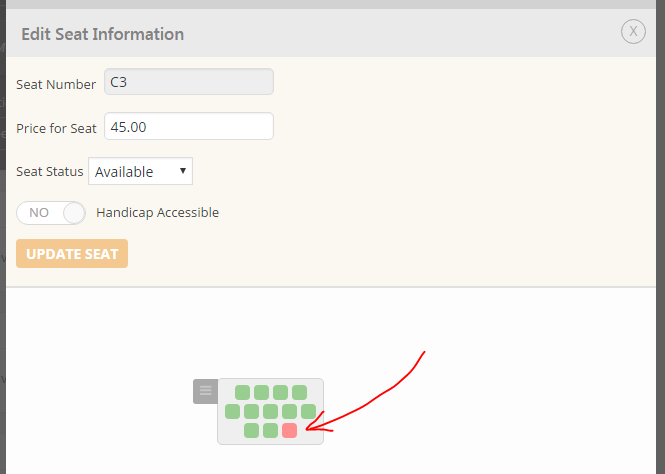 There you will find a seat chart activation button at the bottom. 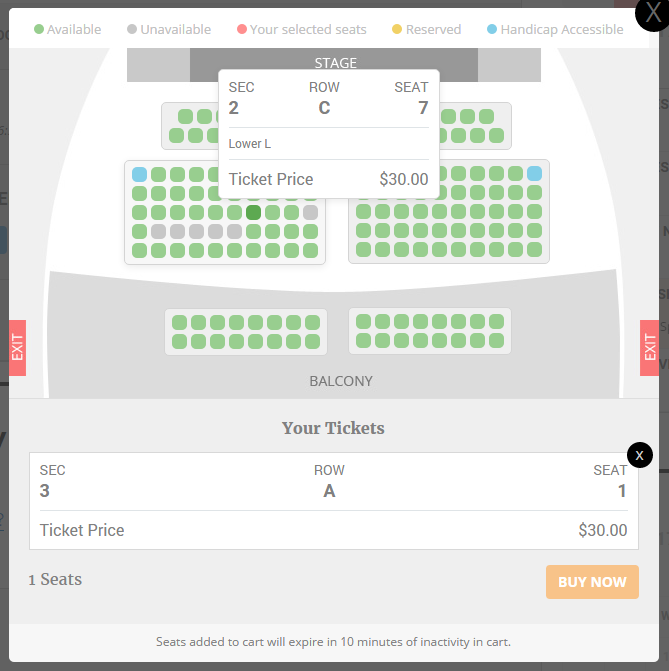 Click “Yes” to active the seating charts for this event’s ticket sales. 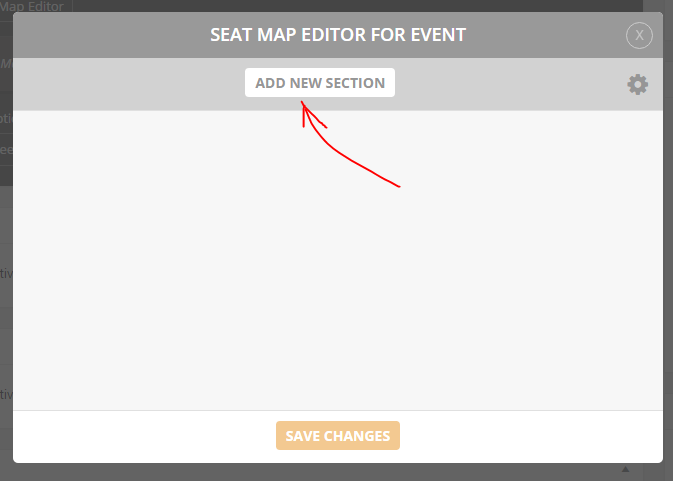 Click “Open seat map editor” and then click “Add new section”. Definitions: A section represent a table or a section of seats at the event such as VIP only table. One section will have multiple rows of seats. And a row can have at least 1 or more seats. Continue to click “Add New Row” and fill in the information until you have the number of rows you need in this section. Use the handle box, on the left side of your section box, to place your section where you want it in the map area. By clicking on your section and using the action buttons that appear at the bottom of the window you can edit, delete, or rotate the entire section. 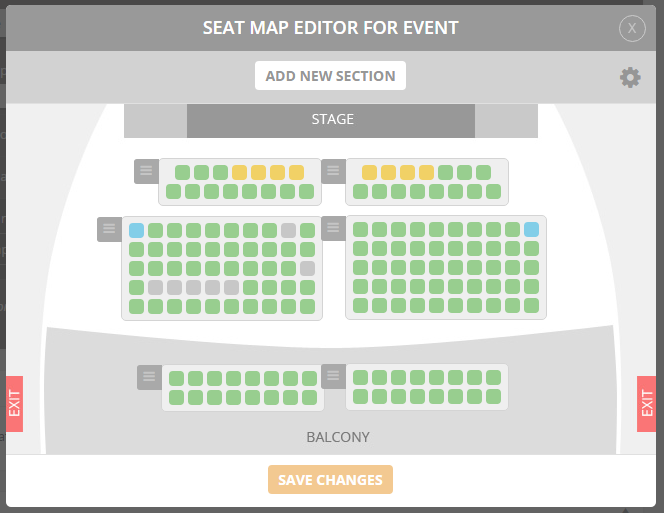 OPTIONAL: Once in edit mode, you can customize each individual seat price by clicking on each green seat. Fill in your seat number, price, seat status, and handicap accessible. When finished click “Update Seat.” Continue this process until you have customized as many seats as you need. The cog wheel icon, at the top right, allows you to edit the entire seat section settings. Here you can customize things such as underlying map image and sizes. With the abundant customization options available, you can create a seating chart that matches perfect with your venues layout. See example below. Creative Hint: Use the background image as a place to show where the stage, bar, etc are located for your venue. This will allow you to see the correct proportions in order to make sure your newly created seat sections will fit in the space as well as allow your customer to pick their perfect seat. Now go to myEventON > Settings > EventCard Data and enable Event Ticket Box. Next lets check out the front end view of your event. Go back to “Events” (top left hand side) and click on the name of your event. Once there, click on the permalink under your events name. When this opens you should see a “Select Seats” button. 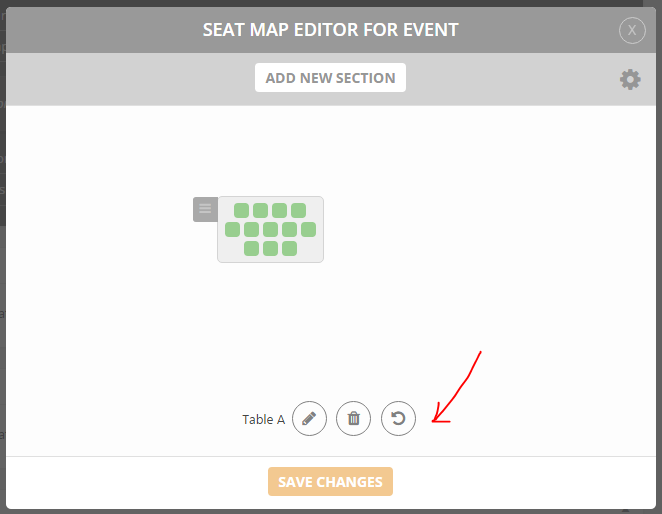 Clicking this opens a lightbox with the seat map you just created.